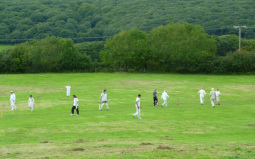 The 4th annual village-vs-church Agricultural Cricket Match took place in Bumpsey's Meadow on 29th August 2015. It was a great day despite having only 3 days to get the field cut after the monsoon stopped. The winners were the Church team – again. It came down to one run needed off one ball left, and Leal Ignatius got it. Unsurprisingly, as he had needed 19 off the last over and didn't seem to have any problem with that, carting the first ball into the neighbouring field. There was a celebrity guest player, a great turnout of spectators, the usual superb barbecue feast managed by the Arend family, Mabel's vintage ice-cream van and some mellow rock-and-roll from Dave Colli. The first annual Heanton cricket match, played in Bumpsey's Meadow on 20 August 2011, saw a comfortable win for the 'Village' team captained by Steve Crowther, over Rev Iain Robertson's Church team. Both sides were packed with ringers, but it made very little difference to the standard of play which was generally agreed to be awful, on a surprisingly forgiving, if lively, wicket formed by the public footpath crossing the field. The torrential rain that had fallen all week held off for just long enough to allow a 15-over game (it would have been 20 but everyone was out), after a barbecue expertly cooked by the massed Arend family at Eastacombe House. Tea was provided by the ladies of St Augustine's Church. Rev Iain Robertson has been appointed to take over the mission community of Heanton, Marwood and West Down, following the retirement of Rev Sarah Wood. Iain (right) is a Somerset man and a keen cricketer. He and his wife Anne-Marie were previously based in Birmingham.